The cabin was conceived and built by the design bureau Myasishchev, it was then tested on the OK-GLI shuttle. The module of 5.4 m length , more than 5 m width and of 5.4 m height entirely in metal and hermetically welded, shelters the control unit of the crew, the electronic equipment of piloting and SGO equipment. The body of the cabin includes an outside envelope, six beams of reinforcements, the dividing fronts and back walls and is composed of "corrugated" panels manufactured by the milling of aluminium welded alloy plates then sets together. The structure is reinforced by beams at the place of the trap doors and port-holes of glass because of the variations of curve of surface. The large-sized beams reinforcements are fixed on the external part (panels of the envelope) by mechanical welding or joints. The top and lower floors are used as reinforcement as well as the dividing walls. 1-Flight deck; 2-Mid deck; 3-Equipments deck; 4-Airlock; 5-Commander seat (PM1); 6-Pilot seat (PM2); 7-Onboard engineer seat (PM3); 8-Place for the rendez vous operator (PM4); 9-Place for the KBO PG operator (PM5); 10-Place for the PG specialist (PM6); 11-PG specialist seat (décollage- atterrissage); 12-Trapdoor; 13-Trapdoor to the life deck (normale); 14-Trapdoor to the life deck (secondary); 15-16-Airlock's trapdoor (ChKK); 17-Trapdoor to the equipment decks; 18-Upper porthole; 19-Payload bay's porthole; 20-Bunks place; 21-Stowage place n°1; 22-Stowage place n°2; 23-Stowage place ASU; 24-Pantry; 25-Stowage place n°5; 26-Stowage place n°6; 27-Stowage place n°7; 28-Stowage place n°7a; 29-Starboard equipments; 30-Port equipments; 31-Tools and furnitures for the toilet block; 32-Command module; 33-Star navigation system; 34-Equipment SU, SBM, RVV (PO16); 35-Stowage place n°17; 36-Stock of movie camera bands. The floors and the dividing walls divide the volume of the cabin into 3 sections: the section of piloting, in which the crew settles, the livable section in which is located the computer, the trap door for accessing the cabin, as well as the possible travellers, and the section of the machines in which is located the auxiliary equipment and the various systems; the connection between the 2 levels is ensured by a trap door. 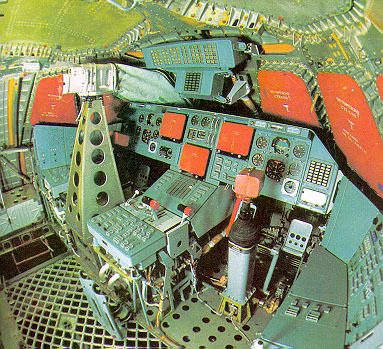 On the front and rear dividing wall, there are electrical panels which make it possible to control the various equipments of the shuttle. The rear dividing wall is drilled by a circular opening which makes it possible to install the equipment during the assembly, but also to put there the SHKK module or CM for the exit in space. 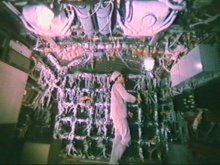 In the top part of the cabin the installing of an ejection system for the seats (for the pilot and the copilot) is possible. To limit the heating and to reduce the noise level, the cabin was covered by a heat shield. 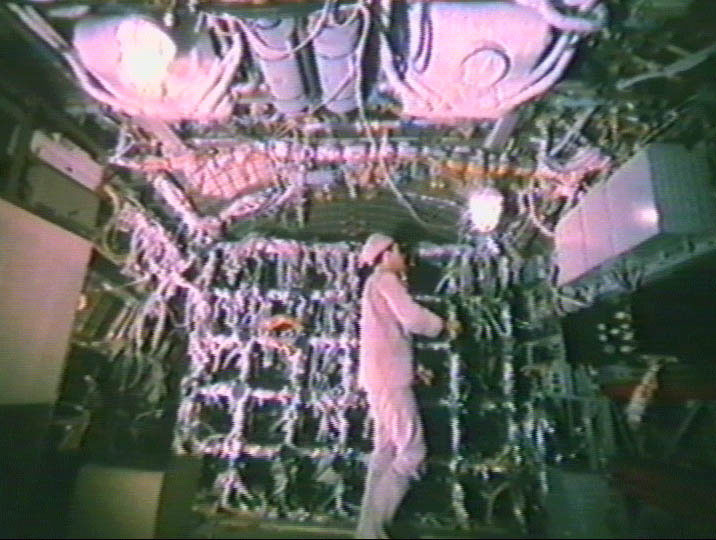 The main problem which the engineers of the cabin faced was its sealing. The length of the hermetic joints is 153 m, the number of joints for the port-holes and the openings are 1018 m and the length of the condensation joints of the envelope (with the double barriers of condensation) is 142 m. Moreover the permissible leakages of air of the cabin were not to exceed 1.5 kg/day, which is equivalent to an opening of 0.35 mm in diameter.